GARDAÍ seized a large quantity of drugs and arrested a man in an operation in Tramore, Co. Waterford today. In a planned operation Garda from Tramore Garda Station, assisted by the Regional Armed Support Unit, searched a premises at Riverstown Business Park in Tramore. 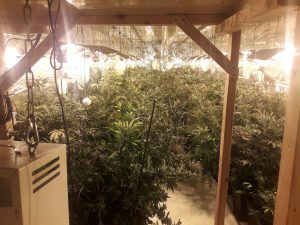 They discovered a large cannabis cultivation operation , with up to 450 plants growing in the building. The seizure has an estimated street value of €360,000.